I can't afford to give away too many knives, but I do the occasional donation piece. 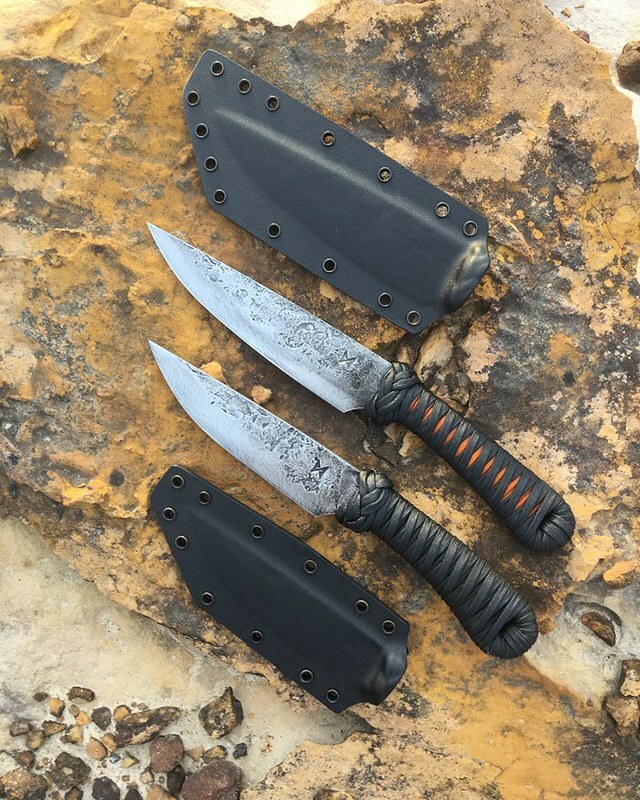 I *always* make sure to donate a blade to Knife Rights for their Ultimate Steel fundraiser (currently forged out), but these two are not for that. The first is for a fundraiser at my old high school, raising money for teachers whose projects for their students go beyond the allotted budget. I never have and never will have any school spirit, but I have a lot of respect for certain individual teachers because it was their efforts in conjunction with mine and not necessarily the institution itself that made a difference in my education. 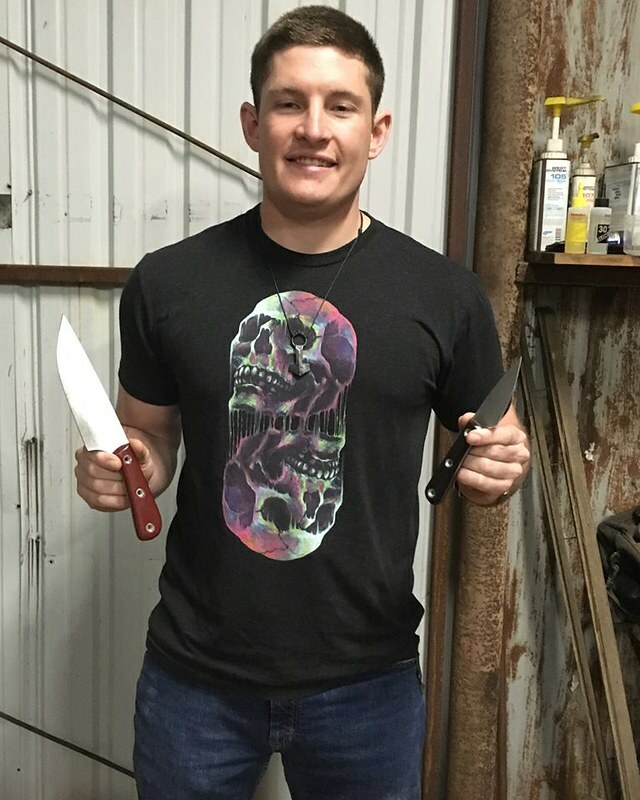 I was approached by an old classmate to make a knife for the fundraiser and agreed to help the teachers going above and beyond the requirements. I used a black and gold wrap because those are the school colors, of course. 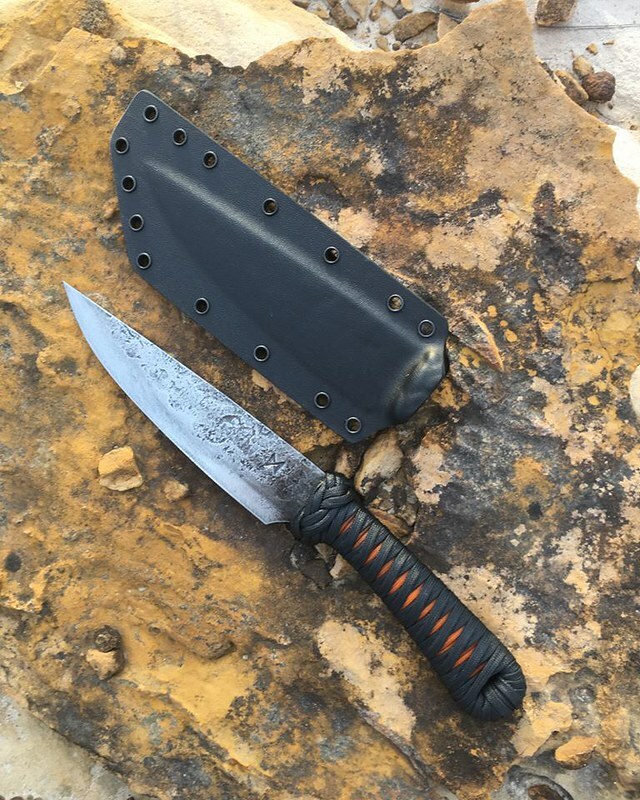 I demonstrated the wrap as a class I taught at Johnny Stout's Guadalupe Forge Hammer-in. The second one is for WISH, a women's and children's shelter in Muskogee, Oklahoma. As there was no requirement for a particular color scheme, I went with a subdued black-over-olive drab wrap. 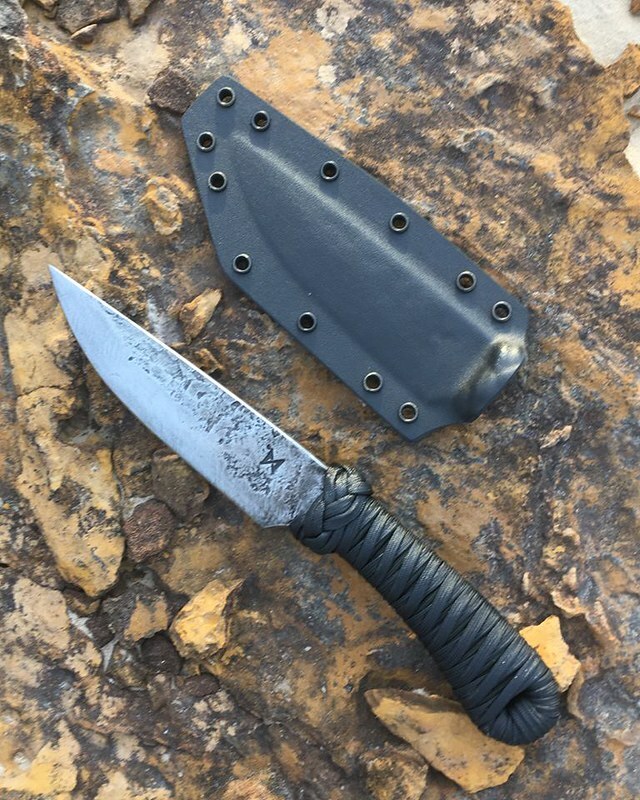 I used this one to demonstrate making sheaths at the same Hammer-in, though I ran long with the wrap class and ended up having to finish out the sheath in a piecemeal fashion the rest of the day after molding. The two together. No reason for the difference in length, that's just how they ended up. And something well outside my usual wheelhouse, a couple of cooking knives ordered up for wedding gifts. 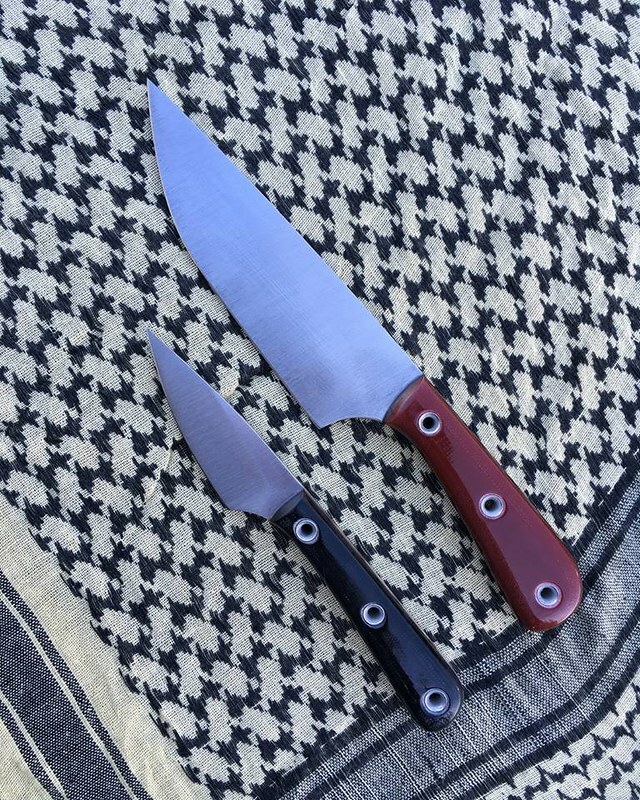 This is the first pair of a series of wedding gift knives since apparently everyone the customer knows is getting married. The customer wanted a 3" paring knife and a 6" chef knife. Handles are red G10 with black G10 liners and black G10 with red G10 liners. 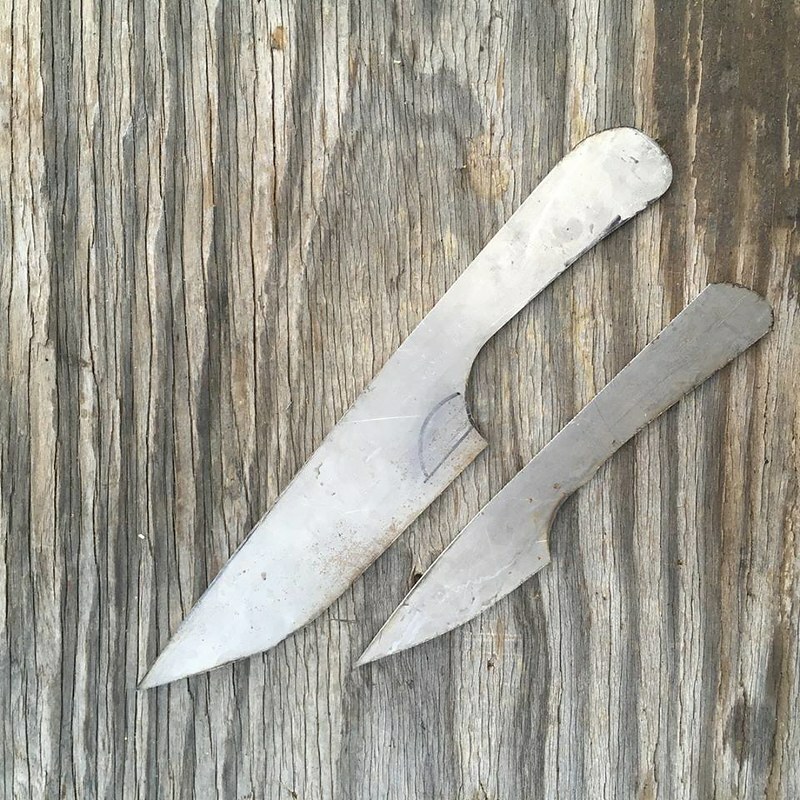 I have made a small handful of cooking knives in the past and never really been happy with them. I've had a lot of trouble with warping due to the thinness of the blades, so in this case I didn't forge the blades at all but cut them from 1/8" 80CrV2 and heat treated them at full thickness. That, of course, meant grinding the bevels carefully so as not to ruin the temper. The VFD controller on my new AmeriBrade grinder helped a lot in that department. The customer wanted a 3" paring knife and a 6" chef knife. He picked them up in person. Good guy! Not the first knife nor the last he'll be getting from me. The finish on these is a machine finish with a Scothbrite belt, with the handles buffed on a fine Scotchbrite ball. They're coated in butcher's block mineral oil (contents: mineral oil). it is always cool to see your work--as Jim said--and for a good cause its even better! You say you dont have "school spirit" but you certainly have talented and generous Hoodlum spirit!!! We are so proud of you man! Those sound like some great charitable causes and they are lucky to have you on board and the winner of those knives are even luckier! Got a few more donation pieces coming up this year, more than I usually do. Probably can't do that many next year. Current time: 04-19-2019, 09:05 AM Powered By MyBB, © 2002-2019 MyBB Group.